It’s not a secret that Daniel Alfredsson left Ottawa for Detroit because of the potential to win a cup. Essentially, the former captain thought the Ottawa Senators were sinking faster than they were swimming and when he got the opportunity to potentially succeed somewhere else, he took it. He signed a one-year contract with the now-Eastern Conference, division rival Detroit Red Wings worth about $3.5 million with deferred bonuses that could see the figure rise to $5.5 million. Some say it wasn’t about money. But the timeline before Alfredsson’s departure suggests that money was a runner-up factor behind the prospect of winning a championship. After Alfredsson revealed to a Swedish reporter that he was returning to play, his agent J.P. Barry contacted Bryan Murray and a meeting between the two took place the following day. This is where the Senator ship began to sink for the sixth round, 133rd overall draft pick. It is not known for certain, however, sources close to the league say Ottawa was looking to sign the 40-year-old for a single year at around $4 million when Alfredsson’s side was looking for a two-year deal at closer to $6 million. Seeing as Alfredsson played for a dismal $1 million in the final year of his contract, it’s not at all unreasonable that he wanted more, especially at his stature. As a UFA he was allowed to window shop before the July 5 free agency kicked off. During the two-day period where teams were allowed to woo free agents, Barry spoke to a number of teams and amongst them was GM Ken Holland and the Detroit Red Wings. According to Bruce Garrioch of the Ottawa Sun, Boston and Detroit were the only two teams Alfredsson had direct contact with. Bryan Murray explained, at that point, that Melnyk had asked him to get a dollar figure from Alfredsson, and to get a deal done. Ever heard of a ‘blank cheque’? That’s exactly what the Ottawa Senators were prepared to do in the end to re-sign their captain, but when Alfredsson called back the night before the opening of free agency, it was to inform Murray that he was moving on. You’d think a captain would go down with his ship, correct? He’s moving on to what he sees as a better shot at winning. Ditch the sinking ship and sail to safety on a cruise liner flying a different red-and-white-coloured flag, right? By doing that, he may very well have allowed the winning flood gates to open in Ottawa. That’s a stretch, you’re probably thinking as you read this. But is it? Consider this depth chart after the most recent Ottawa Senator acquisitions. *Assuming Wiercioh and Gryba re-sign. Let’s put this into context starting with the first line. To begin with, if these three guys can remain healthy, they are all capable of 60-plus-point seasons. Michalek scored 35 goals with the Sens two seasons ago and has consistently scored just over 20 goals in the majority of the full seasons he’s played throughout his career. 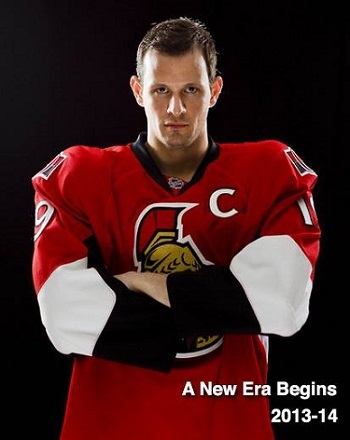 No Sens fan needs to be reminded of what Jason Spezza is capable of when playing at his full capacity. The ten-season veteran averaged 85.5 points a season between 2005 and 2009, and scored 30 or more goals in three out four of those seasons. The key here, however, is his ability to pass the puck. In 2005-06 when the centre man was a goal short of 20 on the season, he tallied an impressive 71 assists for a total of 90 points, good for second in the league behind Joe Thornton in helpers. That’s where Bobby Ryan comes in. For the majority of his time in Anaheim, Ryan played in the shadow of first-line stars Cory Perry and Ryan Getzlaf. In 2010-11, Perry notched 50 goals and Ryan was still able to put 31 in the back of the net with a hand from playmaker Ryan Getzlaf. If Jason Spezza can return to form, and at 30 it’s still viable, he could assist Ryan in putting up 40 goals in an 82-game season. Seeing as a first-line role would see his ice time easily break 20 minutes in most games, there is plenty of room for him to increase his performance totals. And that’s only your first line’s potential output. With Clarke MacArthur, the Sens have a legitimate second-line left winger, especially if he’s playing on Kyle Turris’s wing. While MacArthur has been offensively consistent, Turris has had a much more turbulent beginning to his NHL career . After ‘under-performing’ in his first season with the Coyotes, he has not played a full season since, and therefore, has not had a chance to truly show what he’s made of. In 2013, that chance will be his and he’ll put up numbers we aren’t expecting. Originally he came from a B-list American market and his conditioning was not up to team standards north of the border. He’s now in shape and you can bet he’ll be more than ready to hit the ice full-stride in October. For a lot of hockey people, there may be a question mark on the right wing position on Ottawa’s second line. For me, there’s no question that it should be Cory Conacher. Conacher was a shoo-in Calder finalist at the beginning of the 2013 half-season but he hit a wall which was a signal for Tampa Bay to make some changes. Ottawa had something extra between the pipes and was more than happy to get some young forward talent up front, and that’s exactly what happened when Ottawa sent Ben Bishop to the Lightning in exchange for the 23-year-old. Who won the ‘Les Cunningham Award’ for being voted the AHL’s most valuable player in 2011-2012 after scoring 39 goals and 80 points in 75 games? Cory Conacher. The former AHL MVP may not have adjusted to the quick and constant pace of playing every other night in a jam-packed, half-season schedule which could have been a reason for his decreased output. He’ll be in better shape come October and he’ll know how hard he needs to work off-ice between games to maintain the optimal level of conditioning. And with that, Ottawa’s second line is complete and also dangerous. All you have to do is consider the first two lines and take a quick glance at lines three and four to see the depth. In terms of the forth line, it isn’t certain if J.G. Pageau will crack the squad but his performance during Ottawa’s latest two-round playoff run will bode well for him and he will most definitely get a second look when training camp rolls around. The Senators defensive corps lost Sergei Gonchar, a puck-moving but less defensive defenceman, and gained Joe Corvo who is the same type of player, just a little younger. So if nothing’s drastically changed since this past season, then there’s no reason for the Senators’ D to be any less effective. They, along with Craig Anderson, Robin Lehner, and Bishop before he was traded, backstopped the Sens to second place behind the reigning Stanley Cup champions in goals against in 2012-13. Speaking of Craig Anderson, there’s no doubt if he gets offensive support that the Sens will win more games. Regardless, he’s shown his capacity to steal games single-handedly. A revamped offence and excellence in the defensive zone? What else would a team need to win? The answer is a good coach, and Ottawa has an excellent coach in Paul McLean. The Jack Adams in his sophmore season? You already know that story. With all this being said, no one can guarantee that these factors will be firing on all cylinders. So, at this point the name of the game is potential. Evidently there’s plenty of that. Sens fans, if you’re still tender about Alfie’s decision, try not to forget about what he’s given the Ottawa Senators and the city of Ottawa over the past 19 years. But also remember, that with all of the above taken into consideration, it is indeed very possible that Daniel Alfredsson made a grave error in leaving Ottawa. Look forward to the release of the regular season schedule because regardless of your feelings on what’s transpired, the Wheelhouse will be packed when the Red Wings come to town.